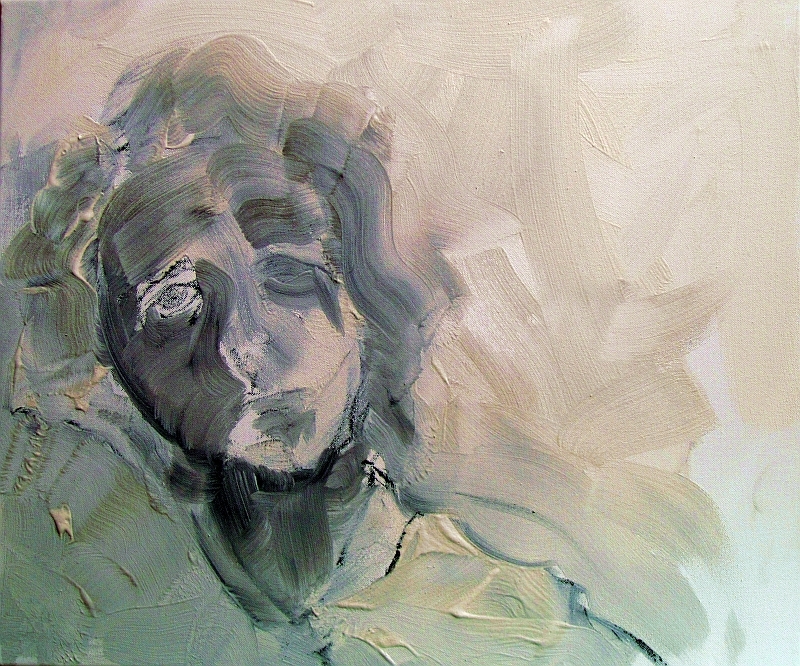 This painting is the first foray into a new medium for mark-making – plaster on canvas. Nostalgia was painted with a plaster slurry by 3 inch brush over charcoal, then tinted with acrylic and finished with oils and lashings of oil medium to bind the plaster together (for how long??) and give it sheen to deepen the cool dreamy colors. The archival properties, or lack thereof, is a real issue if i am to pursue this technique of mark-making further. The plaster is certainly a stable material, but how long will it stay on a canvas? It is a self-portrait done without mirrors or photographs; simply my recollected self-image plus promptings from an 'inner me'. In that sense it may be said to be a non-realist psychological self portrait - a self portrait of recollection. I've dipped a toe into making some of my bits commercially available. I've signed up with RedBubble so that prints and cards of Nostalgia are now for sale from HERE. 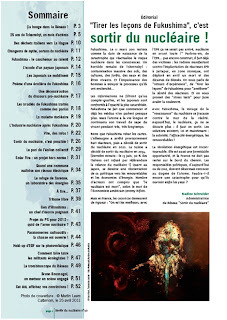 While i was away a picture of my painting Fukushima samurai in the nuclear fires was published in the tri-annual journal Sortir du nucléaire, Issue No. 50, by the French anti-nuclear network Réseau "Sortir du nucléaire", a federation of over 900 anti-nuclear groups from around the world with a membership of over 53,000. 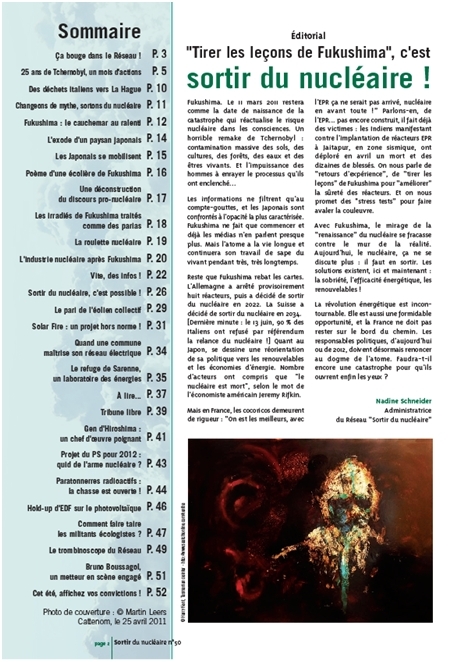 I find it very satisfying that my art is seen as a relevant contemporary voice in the world and is sought out for publication (Réseau "Sortir du nucléaire" discovered the image here in this very blog, folks). Please be patient - it will take me a while to get around my many bloggy friends to see what wonderful things you have all been painting and writing in my absence. You are back with a publication. The article is very interesting. Happy to be french at this time. Your artistic work touches us and it is useful. Great to have you back! It sounds like you had a fabulous time! What a great trip! Congratulations on the acknowledgement of your work in the magazine. Who knows where that could lead? I hope they gave you an attribution and your contact information. You are also back in form with this painting. You are continuing with the ghostly quality you began with the Fukishima series. It suits the idea of recollection and the ephemeral nature of memory. I am sure some of your experiences on the trip will show themselves in your work in small ways as you continue to paint. Harry, it is so good to have you back, and with good news and a good travel report and especially good new work to share! This self-portrait has a wonderful wistful feeling to it, shifting the way one's inner self, or one's perception of self would of course tend to do! And yet it feels quite strong in its identity. It reminds me of certain clouds, when they seem just as likely to go whiter and lighter or let their darker side deepen into storm. One cannot tell, but one cannot look away. Love this work! And it sounds like you had a blast on your hols! Sounds like a wonderful vacation and may I add my voice to the throngs who've missed you here in blogosphere land. I was beginning to suspect you had declared yourself an ex-patriot and were living the good life, drinking those wonderful French wines and gorging yourself on classic cuisine, never to return. That, or you had become addicted to Absinthe, the "Green Fairy", rented Vincent's yellow house and were waiting for Gauguin to arrive. Well, my friend, we're all pretty jazzed to see you back and continue to be astounded with your work. Not unlike the French Anti-Nuke journal. I had a feeling the world would find your Fukushima works and embrace them. Congratulations Harry and let the journey continue! Hi Olivia - it's good to be back and see your wonderful watercolor townscapes. The page i posted is Xavier's editorial. He has kindly put a copy of the magazine into the post for me and it is speeding its way here even as i write. And yes, Vive la France! Greetings, Skizo. Love the surreal chalk drawings you are doing! Glad you are back, Harry! Looking forward to watching your new explorations with paint and other media. Hi Davida, great to be back. Yes, i seem to be having some luck with publication. I've just now allow a journal connected to the UN to publish one of my Fukushima Ghosts. So youre right to pick up on the ephemeral thread currently running in my work. Greetings, Gabriella. Yes, a wistful melancholy mood came over me as i started to paint and i guess that told my hand what to do. I was playing Joni Mitchell's "Both Sides Now" at the time, so it fantastic that you should think of clouds! The rest of the credit i give to the plaster slurry. Caio, thanks for the welcome back, my friend. Hi Liz. Yes, i had a great time, thanks. Hi Gary. Thanks for the hearty welcome back. Well, i did see the spot where the Yellow House once stood (it's been long pulled down) but did get to wander the flowered courtyard of Vincent's Arles Hospital. And now it's time to do some work! Good to make contact again, Gary. Hi Nicki. Yes, i'd best get on and actually do something, lol. Sounds like a wonderful trip, some good exposure when you returned for your Fukushima works, and can't wait to see more of your semester stuff as it moves along. Welcome back! Nice to see you around!! !Let's go to work... I'm anxious to see new works!!! Nice to see that you're back and continuing with your creative urges. Looking forward to your future exploits. PS. Great character in your featured work. this portrait is really personal, psychological, and shows us a placid presence,gently illuminated; very beautiful! I am happy to know that your rest has been so nice and great company of the masters! and also be present in the journal Sortir du Nucléaire, deserved recognition of your work! You sound so refreshed and energized! Visited your RedBubble. I've been exploring the notion of selling prints and cards. The two images you put up look fantastic in the print and card format. I'll be sure to mention it on my networks. Both you and Brian Sylvester inspire me to imagine that one day people might want my work. I've been absent from my blog due to health and other challenges but I am re-energizing to get back in the swing so to speak. I cam see how Both Sides set the mood for the recollected self, soft edges and colour. The slurry and 3 inch brush give the sense of what it's like sometimes in life, seeing the big moments blend into one and little details fall away. Thanks, Rhonda. All i gotta now is actually paint something! Just can't seem to get going. Was lovely to read your interview and see your work being celebrated. Hi Jaime. Yes, that's it. Crack the whip. I MUST start painting! Thanks, Celeste. Actually, i'm only trying plaster because i'm a cheap-skate. I'm searching for painting materials that are cheap and easily obtainable so i can paint large pictures and fail often as i learn. I tried bitumen but it's very carcenogenic, i'm told. So hello plaster slurry. Thanks, Richard. Thought of you on Saturday when i was rostered on to mind the Launceston Art Society office at Eskleigh and saw your winning entry from a few years back proudly hanging on the upstairs landing. And you sure a hive of activity at the mo. Thanks you Denise. Yes, i must be mellowing in my old age. Glad you like the painting. Hi Elizabeth. Yes, Brian is amazing. He has gone from strength to strength. I thought i would have a little try, though most of my work is not very marketable. Too confronting/affronting, lol. But i can probably pick a few more bits that might look OK on a card. Though i like the way RedBubble will also do reproductions on canvas. Your recent work "Slippage" would look great were you to give RedBubble a try. What a fabulous exhibition for it to greet the public that was! Very sorry to hear about your ill health but pleased to read youre bouncing back. WOW!!!! Back to the saddle again!! This is gorgeous!!!!!! Not quite back in the saddle, Jaime. More like still trying get the saddle on the horse. Hi Regina. I'm so pleased you came by. Haha, a kid playing in puddles - THAT'S my art! Welcome back and many congratulations all the way around! The universe has been smiling lately, and your hard work and determination is paying off. Well done! I look forward to hearing more about your travels and maybe some photos on your other site? Thanks, Brian. I'm still sorting through photos, cropping and adjusting but i'll stick a few into Crystal Cornea soon. You blog is looking great, your work is looking great. Dammit, YOURE looking great! Nice to catch up, friend. Haha, Regina, yes, i knew that! But liked it anyway! Hey, maybe i can become one of those Batman baddies - The Muddler. Sounds better than The Puddler which has geriatric connotations). Thanks for the good vibes, Bob. Though scary? Moi?? Authentic and mild as as the Buddha himself, haha. it is so great to have you back, reading your caring, inspiring words, looking at your wonderful art. I also suffer from nostalgia/melancholia lately. Your selfportrait is beautiful, sad but not sad if you know what i mean. I don't know an english word for it, it's about spleen..... i love the haziness, the hint of shadows from a past? Congratulations for being published!! That's awesome. Now i'm going check out Red bubble (i have a account there too) A print of your work will make ma happy! I am so pleased my comments connected with your Middle of the Night piece. I really believe that the visual arts are another language and i'm very conscious of struggling to master its syntax. So i go out on a limb, rather like plunging in with tourist French or Dutch. I'd be delighted were you to find a print there that you liked. I'll be adding a few more in the next few days. Or if there is any particular work of my mine you would like to see there, just say. I am glad to see you again and catch up on your work, after so long.